42 p.p were in Zambrow as POW's between 10/09/1939 - 13/09/1939, presumably he was with them. 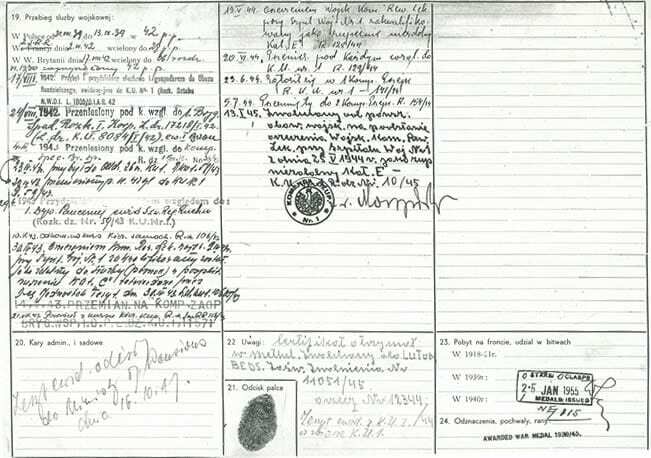 Notice that the military record (left) states he was with 42 p.p until 13/09/1939. Wladyslaw escaped and joined another unit (unrecorded and unlikely). 28 Pulk Piechoty or 28th infantry Regiment (part of the 10th Division) was formed at Lugovaya by General Anders (Anders Army). Interestingly there was parachute training that went on there in -43C and using a tower as well! Polish - Uwagi: Od 3.IV.42 to 7.V.42 transport z Z.S.R.R. do Ośrodku Zapasowego w Polskich Sił Wojskowych. This is most likely the journey from Lugovaya in Kazakhstan to Krasnovodsk in the Soviet Union and then across the Caspian Sea to Pahlevi. In Pahlevi was the "base camp". However those arriving in Pahlevi were quickly assigned to other camps in the Middle East so this line lacks clarity. Polish - 24.VIII.42. Przeniesiony pod każdym względem do 1 Brygady Spadochronowej Rozkaz I. Korpusu L.Dz. 17218/I/42 and L.Dz. KU. 8084/1/42 (Orders recorded by I Corps and by Komenda Uzupelnien under two different numbers). The Polish troops in the Middle East were I Corps and the Polish troops in the UK II Corps. So Wladyslaw moved from I Corps to II Corps at this point. Polish - 21.VII.43 – powrócił z kursu kierowców samochodów Rozkazy Dzienny Szwadron Sztabowy R.R 156/43. English - 19/05/1944 by decision of the Military Medical Review Board at the Army Hospital No. 1 classified as completely unfit Category E”. According to this site (Polish Military Hospithttp://www.ostrycharz.free-online.co.uk/PolishWomen.htmlal No 1 at Taymouth Castle, near Aberfeldy) Army Hospital No. 1 was at Taymouth Castle, Aberfeldy.